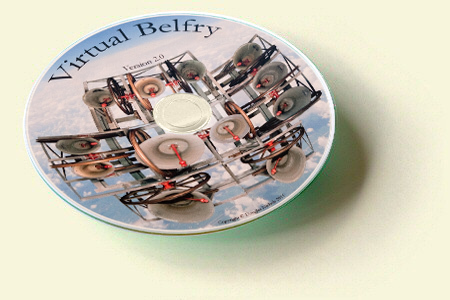 Virtual Belfry's layout comprises a control panel on the left, which you use to choose settings and configure all aspects of the program, and a choice of views occupying the main part of the window (any of which can be opened in a separate window if desired). Click on parts of the image below - or use the links on the left - for more details. The tab button for the Bells view is sometimes hidden (because the animated images must be purchased separately). You can also hide windows that you are not using. Hidden windows do not have a tab button in the strip across the top.